Alrosa, the largest diamond miner in the world, and a public shareholding company listed on the Moscow Stock Exchange, has replaced its chief executive, Andrei Zharkov (lead image, left) , twelve months before his contract was due to expire. On Monday the company refused to announce the change, or explain the reason. It refused even to disclose that Zharkov’s contract, which commenced on April 23, 2015, is for a three-year term ending in 2018. Nor has the company confirmed that Zharkov’s replacement is Sergei Ivanov Junior (right side, 1st) the 37-year old son of former Kremlin chief of staff, Sergei Ivanov (right side, 3rd). Sources close to Alrosa in Moscow and in diamond trade centres abroad believe Zharkov’s abrupt ouster was the outcome of a power play between former Finance Minister Alexei Kudrin, an economic advisor to the Kremlin, and Yury Trutnev, the deputy prime minister in charge of the Russian Far East. For many years the dominant state official on the Alrosa board, Kudrin was defeated. Trutnev, victorious, leaked first word of Zharkov’s replacement by Ivanov on February 27. 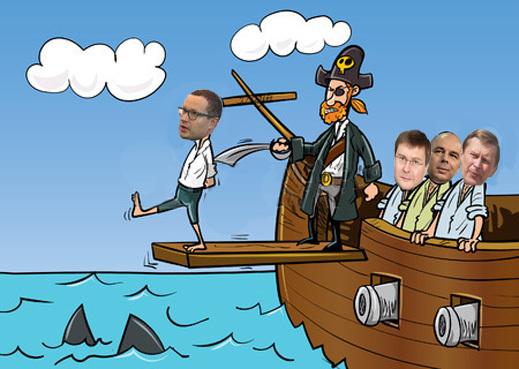 The sources also reveal that Zharkov, a long-time protégé of Kudrin and subordinate of the current finance minister Anton Siluanov (lead image, right centre) was removed for pushing too hard the share sell-off and cash collection schemes of the Finance Ministry, also touted by Kudrin. The Sakha republic, where most of Alrosa’s mines are based, and which holds 25% of the company’s shares, opposed Zharkov, and got Trutnev to agree. Medvedev and President Vladimir Putin then decided that the man they could trust to satisfy the locals, but remain under their thumb, was Ivanov Junior. “This is piratization by the state,” explains a London source. “It makes nonsense of the privatization of Alrosa shares, of the 34% free float, of the governance rules of the company. It is simply state companies reverting to form – that’s Soviet form but with less control than in the Soviet days. It’s now a gang of men wearing state uniforms feathering their nests.” State piratization is so sensitive that noone inside Alrosa, and almost noone in the Russian diamond industry, will admit what is happening. Ivanov’s response to Medvedev’s nod was a statement of the priorities he has been assigned: “Certainly, as tasks I see building the company’s reserves and production capacity, the sale of non-core assets, and of course, the modernization of production throughout the supply chain.” The last phrase is interpreted by Russian diamond industry sources as a reference to a pet scheme which Trutnev has been promoting for several years, but which he failed to impose on Zharkov’s predecessor as chief executive, Fyodor Andreyev. Andreyev survived Trutnev’s attack, but not cancer. He died on January 30, 2015. His record at Alrosa can be followed here. Another diamantaire (as diamond manufacturers and traders are known) explains that Zharkov put himself in opposition to Alrosa board members and the governments in Moscow and Yakutsk, the Sakha capital, on three issues – the cashflow of the company, which he tried to conserve for corporate purposes; the share capital of the company which he was ready to sell off; and the diamonds, which Trutnev aims to divert through the Vladivostok Free Port. Trutnev’s scheme has been to build new diamond cutting and polishing plants in Vladivostok, with tax and export privileges enabling diamonds to be moved from Alrosa through Vladivostok and into offshore markets, a margin of profit sticking to a variety of fingers, either on the way out or kicked back. In theory, the scheme is a way to generate more local jobs in the fareast from beneficiation or processing of rough diamonds into cut and polished stones. In practice, it is a method for corrupt diversion of Alrosa’s rough into preferential, cut-price channels, the profit of which is banked abroad. For details of Trutnev’s effort at “modernization of production throughout the supply chain”, according to Medvedev’s script, read this report from April 2014. A month ago, according to an announcement by the state news agency Tass, Zharkov had accepted the federal Finance Ministry’s directive for further privatization of Alrosa’s shareholding, cutting the state share dramatically, and virtually wiping out the Sakha republic’s practical control of the company. 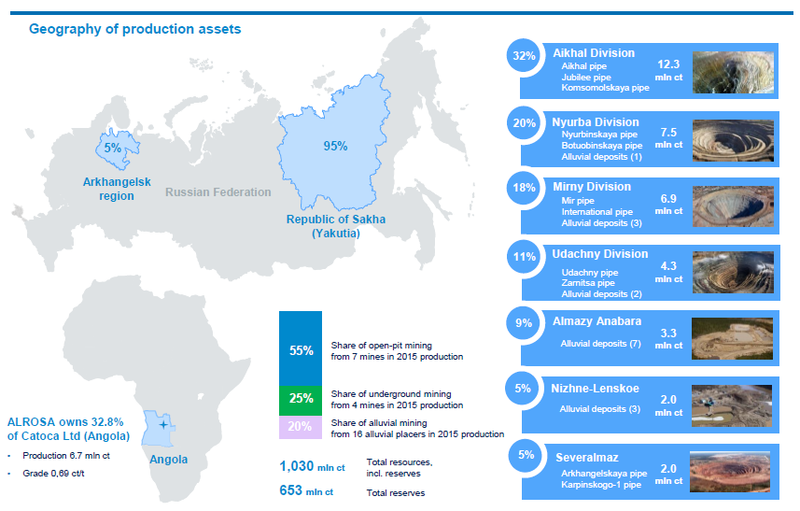 “The plan [for privatization in 2017-2019] contemplates lowering of Russia’s participation interest in the charter capital of Alrosa to 29% plus one shares and coordination of sales of shares owned by the Republic of Sakha (Yakutia) and in municipal property”. The state-owned diamond polishing company Kristall, based in Smolensk, has also been slated for privatization. Zharkov was chairman of the Kristall board for several years. For background on Kristall’s place in the Russian diamond sector, read this. 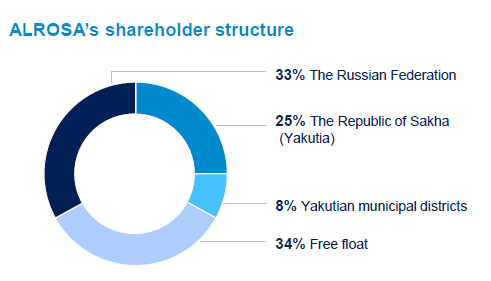 Six weeks ago, an Alrosa presentation indicated that the company’s current shareholding comprises 66% of state-owned shares. These are divided between the federal government (33%); the Sakha republic government (25%); and the Sakha district administrations (known as uluses – 8%). If Zharkov had remained at his desk, and Siluanov and Kudrin got their way, these state entities will soon end up sharing just 29% plus one shares; that’s a cut of 35% altogether. At the same time, the plan was for the purported free float to rise from 34% to 71%. In fact, the real shareholding control would pass, according to Alrosa insiders and diamond industry sources in Moscow, to a takeover bidder picked by the Kremlin. Contenders in the past have included Vladimir Potanin, control shareholder of Norilsk Nickel for which Zharkov worked as an engineer; and Suleiman Kerimov, control shareholder of Polyus Gold. Read more of Kerimov’s attempt with the help of First Deputy Prime Minister Igor Shuvalov, here. Shuvalov did no better with Kerimov than Kudrin and Siluanov with Zharkov. The current Alrosa board includes one figure with a business link to the aluminium oligarch, Oleg Deripaska; Zharkov also worked for him for a time. Deripaska, too, may be a contender for a Kudrin-driven selloff. For the time being, Trutnev has persuaded the Kremlin to block an oligarch takeover, and put Ivanov in as a stop-gap, while Trutnev and his allies in Moscow and Yakutsk help themselves to Alrosa’s cashflow and diamonds. Since graduating from Moscow State Institute for International Relations (MGIMO), Ivanov has moved from one state entity to another – Gazprom, Gazprombank, Sogaz (Gazprom’s insurance arm), and Sberbank. No diamond industry source claims to have encountered him at any point in the diamond production chain. In its January 20, 2017, presentation, the company reported a substantial pickup in sales revenues, earnings, and free cash flow. A year ago, Zharkov had also agreed to a cut in capital expenditure from a peak at Rb39 billion in 2016 to Rb32 billion projected for this year, and just Rb21 billion in 2018. The good news has also driven the rise of Alrosa’s share price on an upward trajectory that has been much better than the Moscow (MICEX) stock price index or nickel, copper and precious metal miner, Norilsk Nickel. With such a trajectory, critics of Zharkov and the Finance Ministry accuse them of privatizing a 10.9% shareholding from the federal government’s stake last July at much too low a price. The sale was fixed at 65 roubles per share. At the time this was at a modest discount to the market price, but that price was about to take off, as can be seen from the chart. 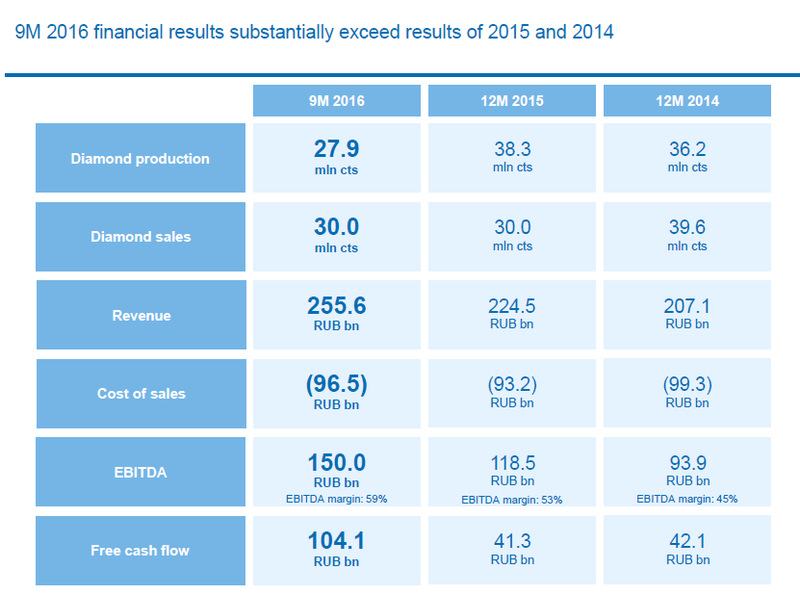 Between the privatization fix at Rb65 in July and peak price at the end of this past January at Rb108, Alrosa’s share value and market capitalization jumped by 59%. The market cap at peak was Rb800 billion ($13.3 billion). A Bloomberg report of September 28, while Alrosa’s share price was still accelerating, called the privatization price the “fleecing” of the Russian state budget. The report added: “Economy Minister Alexei Ulyukaev was probably too quick to declare the sale of a stake in the world’s largest rough-diamond producer ‘exceeded expectations.’ Priced at 65 roubles a share in the July offering, Alrosa PJSC closed on Monday almost 38 percent higher at a record 89.99 roubles, meaning the government effectively lost out on almost 20 billion rubles.” In retrospect, following Ulyukaev’s arrest in mid-November and jailing on charges of corruption in the Rosneft share sale, there is a hint that the Alrosa share selloff may also have been corruptly favourable to selected sharebuyers. Noone accuses Zharkov of wrongdoing in the privatization schemes for Alrosa. At the same time, noone will openly identify what the money motive is for his ouster, and who benefits from Ivanov’s appointment. Sakha President Borisov was asked whether Sakha opposes the privatization selloff to 29%. In that plan, how much of a shareholding does the Sakha government calculate it would be left with, after the privatization? Finally, Borisov was asked, was Zharkov viewed as in favour of this privatization, and did that make him the enemy of Sakha’s stake in the company? What Borisov is signalling is that he and the Sakha government oppose the planned privatization to diminish its shareholding in Alrosa. 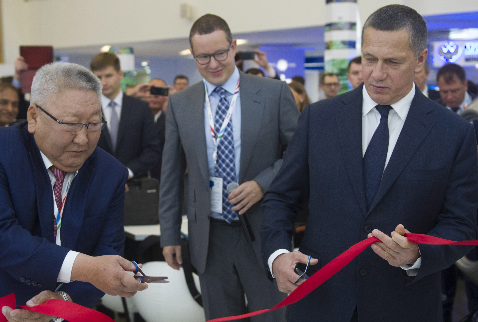 It will encourage more, not less capital spending by Alrosa in the region; and it wants more rough diamonds to flow from Alrosa into new cutting and polishing enterprises in Vladivostok, and in the Sakha republic, too.